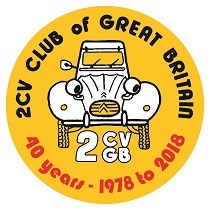 Whilst every effort is taken to ensure accuracy of information and advice given in any article, neither the Deux Chevaux Club of Great Britain (2CVGB) Limited (the "Club"), 2CVGB Parts Ltd, and its officers, nor the members and authors of such articles, accept any liability whatsoever for such advice. 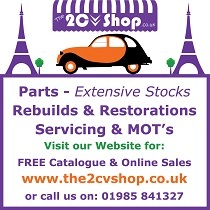 The Club nor 2CVGB Parts Ltd makes no representations, warranties or guarantees, whether express or implied, that the content is accurate, complete or up to date. The content is provided for general information purposes only. It is not intended to be advice on which you should rely. You must either satisfy yourself as to the accuracy and completeness of the content and/or obtain specialist technical advice before taking, or refraining from, any action on the basis of the content. You are responsible for checking any applicable manufacturers' instructions, safety manuals or any other relevant instructions before undertaking any alterations to your vehicle. that the Technical Information will not infringe the intellectual property or other rights of any third party. The views or opinions expressed by our contributing writers should not be interpreted as the views and opinions of the Club or 2CVGB Parts Ltd.
Where the website, 2cvGB News magazine, our official social media (Facebook and Twitter) or our forum contains links or references to websites and/or resources provided by third parties, these links or references are provided for your information only. 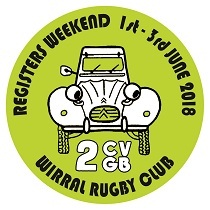 Such links should not be interpreted as approval by the Club or 2CVGB Parts Ltd of those linked websites or information you may obtain from them.